This was one of my first ever items of clothing. I went to a learn to sew jersey class at Guthrie and Ghani about four years ago, and made this Coco top from Tilly and The Buttons. 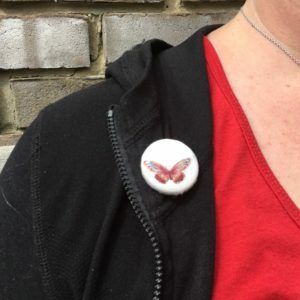 I’ve worn it so much since, I really should make another one. 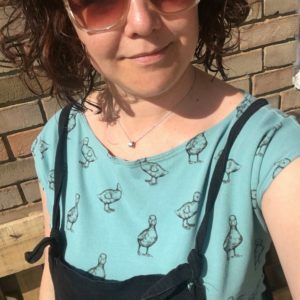 I have recently discovered the joy of using my overlocker (I was scared of it for a long time…) and making clothes is a doddle with it. Unless of course you clip a pin and jam up the machine resulting it in needing to be taken to sewing machine hospital *sob*. 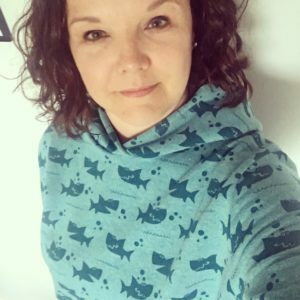 Anyhow, my lovely friend let me use her overlocker to finish this hoody. Its the Hot Coffee from Made By Jack’s Mum and it is my new favourite thing. I already have the fabric to make my next one once my poor overlocker has been mended. This t-shirt is another recent make. 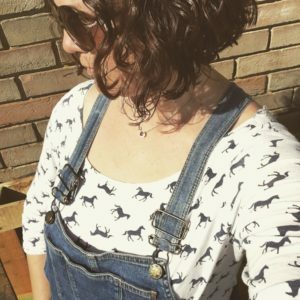 Using the Kirsten Kimono tee pattern it is my go-to t-shirt pattern (expect to see a few over the coming month…). I’m also beginning to realise that I have a thing for duck egg blue. Ok, so I didn’t *technically* sew this but I did make it. I do like a good pin to liven up an outfit. I have some in my etsy store should you fancy a look. This is another slightly tenuous one. We spent the weekend camping in a woods celebrating some friends’ 40th birthdays. Saturday was the official “party” and it was fancy dress with an Under The Sea theme. 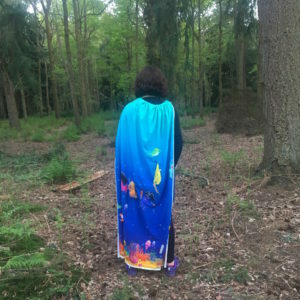 I made myself and my husband a cape each using this awesome fabric and plastic rubbish that my mother in law had collected from her beach. Sadly I forgot to pack something handmade when I was packing to go away so I have failed in my Me Made May challenge before a week is up. But it has made me more determined to wear handmade for the rest of the month. So, that was my Me Made May week one, and I’m looking forward to week two. Now, if you could all keep your fingers crossed for my overlocker’s safe return that’d be ace.